This hit Doris Day song is a mystery in it’s origin. At least to some point. Two years earlier, Jay Livingston had seen The Barefoot Contessa and remembered their fictional family motto “Che Sera Sera”. He’d written it down for a song title and remembered this when working on the songs. The men changed the song to a Spanish spelling, because more people spoke Spanish in the U.S. The men used their limited knowledge of the Spanish language. There is no history of this phrase in the Spanish, Italian or French languages. Each verse of the song progresses in the life of a woman from childhood to young adulthood to parenthood. 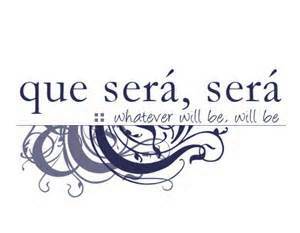 She ask the question “What will be?” or “What lies ahead?” and repeats “what will be, will be” with each verse. The song reached #2 on the Billboard Hot 100 and #1 on the UK Singles Chart. The song was later used in the Day movies Please Don’t Eat the Daisies and The Glass Bottom Boat. 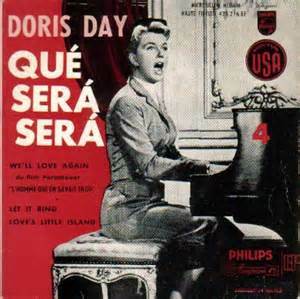 Day also used this as her theme song on her TV show, The Doris Day Show. Livingston and Evans won an Oscar for the song in 1956. You may remember some of their other works, the theme song to Mr. Ed and the Christmas classic, Silver Bells. The song made #48 on the AFI’s 100 years…100 songs in 2004.